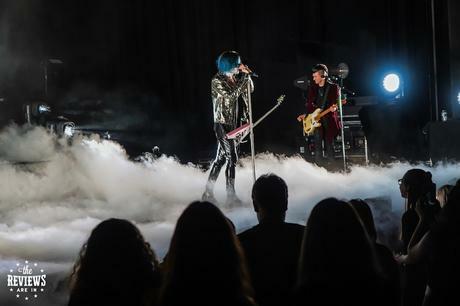 Canada's own Marianas Trench rolled into Hamilton's FirstOntario Concert Hall on tour Tuesday night supporting their new album Phantoms. A packed house greeted the band as they came out on stage through the fog. Right from the start of the show, singer Josh Ramsay had the crowd's full attention. Anyone who knows the Vancouver band knows that their live show is a theatrical performance and this tour is no different. The show was opened by Elijah Wood x Jamie Fine. The multi-platinum selling duo that made their splash on the scene with Ain't Easy and recently released their debut EP, 8:47. With a diverse catalogue from brand new songs to classic hits and even happy birthday, the band had the crowd singing every word. Guitarist Matt Webb even celebrated his birthday on stage with a shot of Jack Daniels and some birthday cake. What a special moment to hear all the fans wish him a happy birthday. As the night was coming to an end, Josh Ramsay took to the stage by himself and performed an acoustic version of One Love before being joined by the rest of the band for two more songs before they said good night. The tour continues on Friday night in St. Catharines, Saturday night in Ottawa, then Montreal and more. Be sure to check out the incredibly talented guys in Marianas Trench one night this week. It's not a show you want to miss. Editor's Note: We were at the Toronto show as well, and both Marianas Trench and openers, Elijah Woods x Jamie Fine were fantastic. The crowd was loud, singing along with both bands, and we agree, this is a show you don't want to miss when you have a chance. Burlington Sound Of Music Festival Unveils 2019 Lineup! 7 Reasons We’re Excited To See Maren Morris at Boots & Hearts 2019!